Apple(s AAPL) is still the world’s leading tablet maker, but it stands alone among the top five tablet makers as the only one to see its second-quarter shipments contract, according to new data published by IDC on Monday. The market research firm found that 45.6 million tablets shipped during the quarter, growth of nearly 60 percent from the same quarter of 2012. iPad shipments, however, were down 14.1 percent between April and June compared to the same time period a year ago. 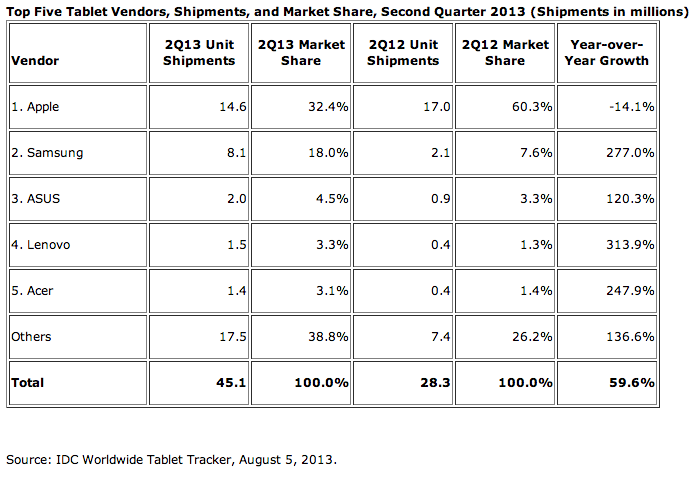 Asus, Lenovo and Acer are shipping miniscule numbers of tablets compared to Apple and Samsung. But Apple’s position is one to watch as Android-based tablets become more widely available and models begin to catch up to the iPad in speed, battery life and screen resolution. The iPad’s year-over-year contraction put it way under the market’s average growth. There’s a big reason for that too: Q2 2012 saw the debut of the third-generation iPad, and a huge quarter of iPad shipments for Apple, 17 million units, predictably followed. Without a new iPad during Q2 in 2013, the shipment numbers suffered. And now that Apple has shifted its iPad yearly model upgrades to the fall — along with the iPhone and iOS — it’s going to be subject to these kinds of quarters that slow drastically in the off months. Does this work good with iPad? Seems cool. Why is Apple refreshing the iPad in the fall? It seems like they’d want to take advantage of the back-to-school rush with a fresh new tablet in July or so. Or are they expecting students will buy one anyway when school starts, and then buy another at Christmas to get the latest and greatest?